Most patterns with different styles make variations on the same main pattern pieces, such as changing length, collar, trim, perhaps sleeve shape in the same armhole. There are many examples in my posts on new patterns this autumn, in businesslike and casual styles. What I’m talking about here is styles so different in shape that they need different main pattern pieces. These basic pattern pieces are called ‘blocks’. I’m not talking about wardrobe patterns – obviously those include top/ jacket/ pants blocks, etc. What features would you like in your collection of basic patterns ? – armhole : fitted, drop shoulder, raglan, cut on sleeve. 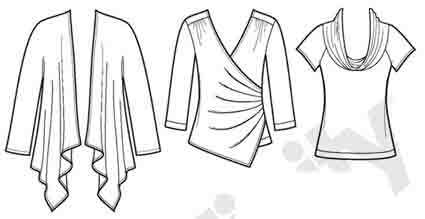 – body shaping : darted, shoulder princess, armhole princess, side panel, wrap, casual-dartless either straight or flared. – amount of ease : close fitted, fitted, semi-fitted, loose fitting, very loose fitting. Simplicity 1943 boleros are all dartless, but have different sleeves and body shapes. One (right) has cut on sleeves. The others have set in sleeves with different bodies : one with flared body and flared sleeves, one with straight body and gathered sleeve cap. Simply lengthen these to get many more styles. Simplicity 2154 has two dartless block jackets with different sleeves. One is set in, the other has a cut-on upper sleeve with side panel below. Simplicity 2208 is for fleece jackets. A dartless flared jacket with slightly dropped shoulder sleeve and either a drape front or big collar. And a raglan princess hoodie. Simplicity 2150 is for jackets and coats. Two jackets based on the same princess block with different centre front panels. 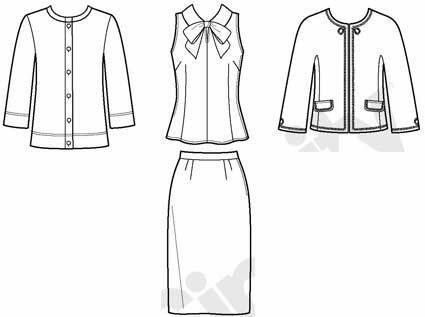 And two dartless styles – jacket size with set in sleeve, or coat size with cut on sleeve. Simplicity 2285 has two raglan sleeve styles, a jacket and cape. Also a princess jacket with set in sleeves, and a dartless vest. 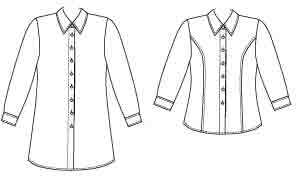 There are many top patterns with ingenious variations in collars, cuffs, lengths, trims etc. But few include different blocks. Butterick 3030 is for easy dartless tops with raglan, cut-on, and dropped shoulder sleeves. Butterick 5526 is for classic shirts, with dartless and fitted princess bodies. 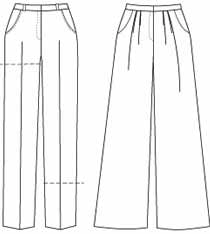 There are several skirt patterns which include both straight and a-line skirts. And 4, 6 and 8 gore skirts. Those may be the first things you learn if you take a pattern making course. McCall’s 6402 is more interesting, with shaped seam, pleated, and drape front styles. Girly at this length. Make it longer if you prefer ! 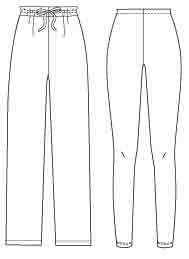 Butterick 5502 has both leggings and elastic waist pants. McCall’s 6403 has both straight and fuller leg styles. Sorry I haven’t found any dresses ! Doesn’t mean there aren’t any, but they do have much bigger pattern pieces so perhaps are less likely. This entry was posted on November 19, 2011 at 8:52 am and is filed under pattern making for clothes. You can subscribe via RSS 2.0 feed to this post's comments. Both comments and pings are currently closed. Yes, several of these patterns are in my collection. Some are recent purchases. I have different fashion moods (personas) that demand attention from time to time so my pattern collection is rather eclectic. Lisanne, I know you are not reviewing books by and large but as it so happens I have the “Built by Wendy” jacket and coat book here. I had previously bought “Sew U” for a friend learning sewing and been impressed with it. 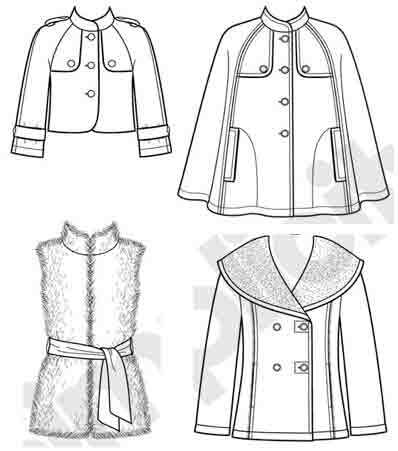 In any case, she offers three basic blocks in this book: princess seamed jacket (armhole princess); jacket with no darts and set in sleeves; coat with raglan sleeves. 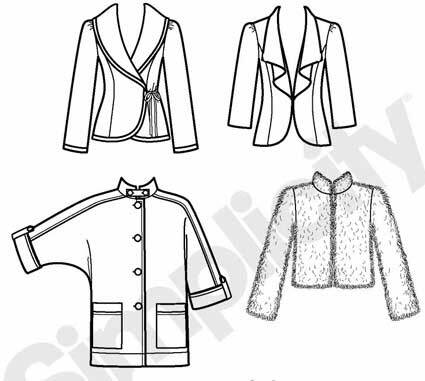 She gives a range of collar and pocket and closure variations, and for each basic block makes up a range of patterns (six for the princess jacket, 8 for the basic jacket, and nine for the raglan-sleeved coat). Each of these patterns also has a variation and they often have several suggested fabrics. I notice she also has a dresses book, according to the reviews it has three basic blocks. Perhaps worth a look. Thanks Elizabeth – yes, I didn’t mention Wendy Mullin for good reason. Here’s my review of the jackets book at Pattern Review. I have the original Sew U book, in which the patterns are all normal. I haven’t seen the knits and dresses books. But reviewers generally comment that the patterns are very over-sized and boxy. Good pattern altering ideas, but I can’t recommend the patterns as a good starting point. I just read your review, so thanks! I read another blogger who also said that the bust size given was the *finished* size with no ease. How crazy is that? On the other hand, the alterations advice is really good and I like her approach. And she _does_ tell you do muslin, even if she doesn’t give you a very good idea of how to do it.